Hiring a collection agency to help in the recovery of past due payments has become part of how businesses run today. However, there are some things you need to know before you go and hire the agency that your Uncle Fred recommended that is down on Main St. Below are some tips to help you on your search! Look for a debt collection agency with experience in your industry. If your business is a dental practice, medical office, law firm or specializes in a trade such as plumbing then your collection agency of choice should have experience in those areas. 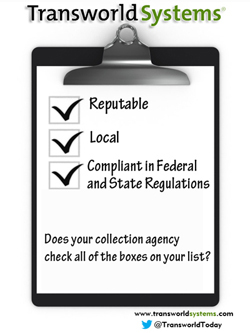 Does your collection agency perform background checks on the collectors? Is the agency compliant in all federal and state regulations? You could be liable for heavy fines if they are not. Make sure to fully understand the fee structure of the collection agency. Do they charge a flat fee or is it percentage based? Percentage based agencies generally focus on larger balance accounts leaving small to medium sized, older accounts, unattended, which impacts your recovery rate. What is their visibility? Good collection agencies should have a strong online presence, visible leadership team and an easy way to maintain two way communication. How long have they been around? Make sure they are a stable company with solid references before hiring. Six easy steps to follow could be the difference between recovering your money or going out of business!! For more information on selecting the best collection agency for your business/practice, respond to me through the contact form below.